There is an online petition calling for public officials to take public transportation instead of traveling in their own cars (with or without chauffeurs). The assumption seems to be that our so-called leaders, particularly those tasked to come up with solution to our transport and traffic problems, do not themselves used public transportation. As such, they are basically oblivious to the daily frustrations of many commuters who have to suffer the uncomfortable, inefficient and, in many cases, unsafe transport that we have in most if not all our cities and towns. But who’s afraid of riding public transport and jeepneys in particular? I would like to think that many if not most or all Filipinos had to ride a jeepney at one point in their lives. After all, the jeepney is second only to the motor tricycle in terms of being the most widespread mode of transport in the country. [Yes, that’s right. The jeepney is not really the king of the road in the Philippines. That title is perhaps more suitable to the tricycle, and I’ve explained this in past posts about the tricycle.] Why do people continue to ride the jeepney despite it being perceived as unsafe and not an environment-friendly mode of transport? Why are these aspects not being corrected by the responsible agencies? These are questions that are difficult to answer only because of the social implications that the government does not want to deal with head-on. 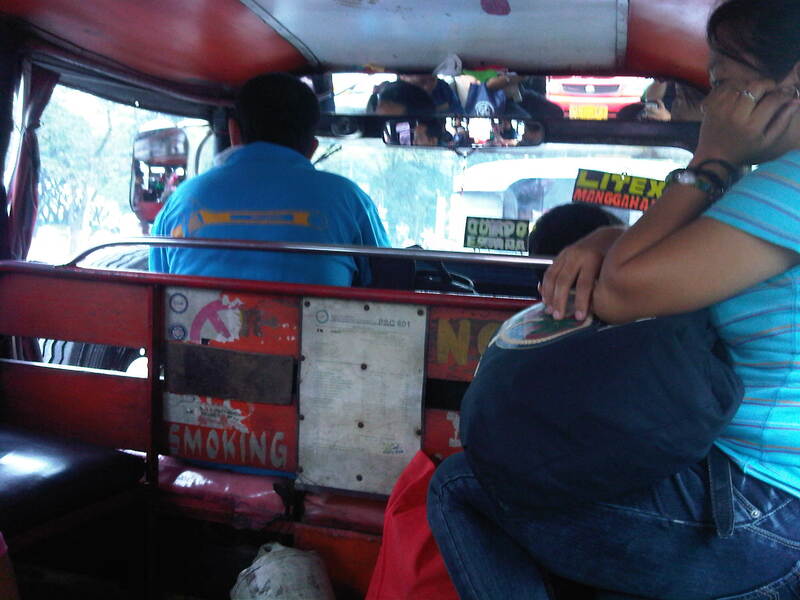 The way jeepneys are designed all over the country, drivers have to deal with the cramped space of the front seat that have implications personal health as well as road safety. The cramped space and overall design of the vehicle affects the driver’s posture as he is forced to stoop in order to have a good view through the windshield. In some cases, those with longer legs would have to orient their seated bodies in a position that is not ergonomic. Such practices or positions may contribute to injury over the long term as well as affect the way the driver operates the vehicle. I’m not into taking photos inside jeepneys (quite risky as it invites attention to you and to your phone) so there’s few (and not so good) photos of my commutes. This one is a good one inside a jeepney bound for Quiapo, Manila from Philcoa, Quezon City. I think that for visitors from other countries, a trip to the Philippines would not be complete without experiencing a jeepney ride. When we do have visitors at the university and if they have the time, we take them around the campus on a jeepney. Of course, this is an easy and relatively safe ride for them considering the “Ikot” and “Toki” jeepneys have routes within the campus and do not pass through busy streets or wide highways that tend to invite speeding. It’s a different thing and quite an experience when you ride the “patok” jeepneys usually plying the longer distance routes like Cubao-Montalban or Cubao-Antipolo. The drivers of these jeepneys are generally risk takers and many are reckless to the point that a slight mistake in driving would likely lead to a serious if not fatal crash. It’s a wonder that they don’t make mistakes often enough for authorities to clamp down on them. Despite this, many people take such jeepneys because they have no choice or if they did, they opt for the aggressive drivers because of the perception that these will get you to your destination faster (Jokingly, it is said that hopefully your destination is not the afterlife.). By d0ctrine in Jeepney, Public Transport on February 5, 2014 .